The axis deer can be traced to the foothills of the Indian Himalayas and island of Sri Lanka ( Ceylon). Their original habitat was open country at lower elevations in forested regions. They have been introduced onto other continents and are a favorite of zoological gardens around the world. Free ranging populations exist in the continental United States, Hawaii, and Australia. Axis deer were introduced into Texas in 1932. Texas has by far the largest population of axis deer in the United States. 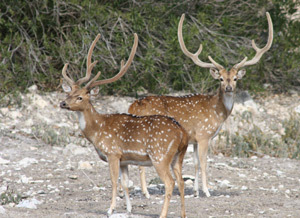 Axis deer have striking reddish-brown coats marked by white spots arranged in undisciplined rows along their sides. They have a black dorsal stripe and a white bib on their neck, white inner legs, stomach, and undertail. Male heights range from 29 to 39.5 inches. Mature weight is from 145 pounds to 250 pounds. Males have darker facial markings with a more pronounced "scowling" expression the older they get. Female axis stand 26 to 33 inches and weigh from 90 to 150 pounds. Axis bucks can be in hard horn any time of the year. They grow and shed antlers on their own clock so in one heard there may be a newly shed buck, a hard horn buck and a buck in velvet. Usual antlers are 22 to 27 inches, with trophies ranging from 30 to 36 inches. Axis have a typical antler structure of three points on each side consisting of a main beam, one secondary point halfway up the beam, and a brow tine. However, four points are not uncommon. It is thought the axis deer are not cold tolerant. In Texas, they have adapted from their Indian average temperatures of 70 degrees to the varied temperatures of Texas. During stressful times, good animal condition and heavy situational feeding have made the difference between high death loss and virtually none. Axis deer appear incapable of putting on intra-muscular fat and are very efficient grazers. They produce lean meat with 0.2% fat or less, and therefore are legally "fat free." The primary diet of axis deer is grass, and they will graze on new weeds and forbs. When grass is not in sufficient quantity, they may browse. Axis graze successfully on native Texas grasses such as curly-mesquite, Indian-grass, side oats grama, big and little bluestem. They do well on improved grasses, such as Klein. Seasonally, they do well on winter wheat. Browse species include live oak and hackberry. Mast includes acorns and mushrooms. In a ranched situation, axis deer are disease resistant and do not require inoculations or worming. Texas fleas and ticks appear to be species-specific and do not bother axis. Axis can get tuberculosis but cases are extremely rare and, in the only documented case found in axis deer, was present in a Hawaiian dairy cattle herd where axis fed. Axis deer have a high fertility rate and can breed year round, usually based on their birth date. A primary harvester of excess animals in the Texas Hill Country reports that they have never harvested an axis female that was not pregnant, lactating or both. Gestation is approximately 7.5 months (210-238 days). In Texas, fawning peaks in January-April and October-November. Researchers report that males in velvet antler can breed. Eight to twelve month old females can breed but the first fawning is usually at 23 months of age or later. It is generally believed that axis does are capable of producing four fawns in three years and are productive to at least age 15. Multiple births are extremely rare but have been reported in zoos and wild populations. One axis buck can service ten to forty females, maybe more. As the excess and older breeder bucks provide good trophy income, there is no reason to skimp on buck availability.